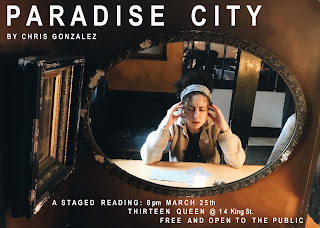 Paradise City is a one act tragic comedy set in downtown Northampton, Massachusetts. Rebecca, a recent widow, works with Liz, a half-baked medium, to converse with the ghost of her beloved. But over the course of the seance both Rebecca and Liz are forced to face something much more frightening than ghosts and spirits: themselves. 13 Queen is an alternative Production Studio and Event Space - Producing Music, Video, Podcasts, Events, Music, Karaoke, Poetry, Comedy, Film, Live Streaming, Meetings.